Because of this requirement, certain businesses opening new accounts (checking, savings, loans, etc. ), adding some business services or renewing a loan or CD will have to provide identifying information on certain individuals within their organization. The person providing this information will sign a certification that the information they provided is correct to the best of their knowledge. Yes, it's a big change, and both banks and businesses will have to adapt to the requirement. On the surface, it may seem like a burden - filling out more paperwork, having to ask your coworkers for personal information, having to meet a deadline or risk an account being closed...ugh. But let's look at it from a different perspective. Anonymous companies are created every day to hide illegal activity. They may be "companies" in name only, having no employees or any real person tied to them. When (if) the government or law enforcement get wind of this illegal activity, there is currently little they can do to find out who is actually responsible for--and who is benefiting from--the illegal activity. Having information about the actual people who benefit from a company's revenue and have a controlling interest in the daily operations protects all of us. Why is Bank Independent requesting information on the owners of my organization? What types of businesses are included in this requirement? Organizations such as corporations, partnerships and limited liability corporations are required to provide this information. Some organizations, such as non-profits, are only required to provide some of the information, and other organizations, including sole proprietorships and government entities, are not included in the requirement at all. Ask your Relationship Banker if your particular organization is required to participate. When do I have to provide this information? You’ll be asked to provide this information every time that you open a new account for your organization, such as a new or renewing loan, deposit account, or safe deposit relationship. You also may be asked for this information when adding certain business services or renewing a CD. Are these individuals required to provide this information in person? No, this information can be provided by the person opening the account on behalf of the other individuals. What if I don’t provide this information for my organization’s owners and/or controllers? We ask that you provide this information within 30 days of account opening in order to keep the account from closing. What does signing the Certification mean? By signing the Certification, you are stating that to the best of your knowledge the information you provided on the form is complete and correct. Are all banks and credit unions required to collect this information? Any bank, savings association or credit union will be covered by the regulations requiring Certifications for this type of information. All information gathered is subject to the financial institution’s privacy and information security requirements. I opened an account just before this rule went into effect. Do I need to provide this information now? No. Certification for Beneficial Owners is required on accounts opened on or after May 11, 2018. I opened an account and provided Certification information. Now I’m opening a new account. Do I have to re-certify? Yes. You will need to sign a new Certification form to confirm that the information on file is still correct and complete to the best of your knowledge. If any information has expired (such as driver license information) it will have to be updated. What happens if my organization’s ownership changes while our account is still open and active? Please contact Bank Independent when ownership or control information changes so that a new Certification form can be prepared and signed. ABC, Inc. is 100% owned by Jack. Jack is the president and primary person with management control over the company. 50% of ABC, Inc. is owned by Jack, and 50% is owned by Jill. John is the chief operating officer and has management control over the company. ABC, Inc. is owned 50% by Jack, 25% by Jill and 25% by John. John is the chief operating officer and has management control over the company. 50% of ABC, Inc. is owned by Jack, and 50% is owned by Jill’s business, XYZ, LLC. John is the chief executive officer of ABC, Inc. Jill owns 100% of XYZ, LLC. ABC, Inc. is owned equally by five siblings, Jack, Jill, John, Jim and Joe. Each sibling owns 20% of ABC, Inc. John is the chief executive officer. Beneficial Owner(s): Not applicable. No individual owns 25% or more of the company. 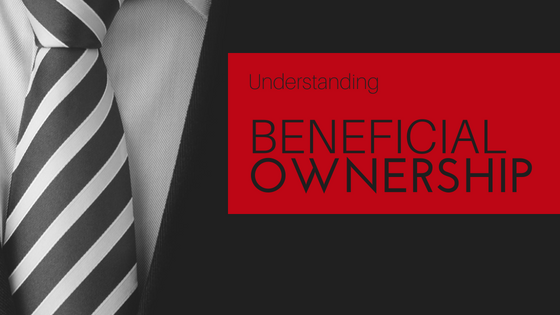 If you have additional questions about Beneficial Ownership, please feel free to reach out to your sales office's Relationship Banker for more information about your specific requirements.